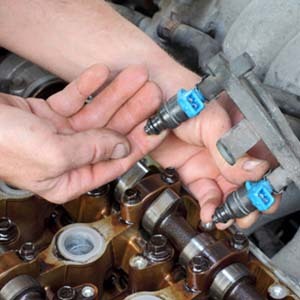 Whenever your EFI is not functioning well, you must realise that either fuel is adultered or injectors are blocked. Backfiring, poor fuel efficiency, technical snag and rough idling during driving are the symptoms of poor EFI. An Electronic control unit (ECU) is the heart of EFI and controls all activity of EFI. On the basis of data obtained from different engine and emission sensors, ECU releases the requisite amount of fuel and air for combustion process. ECU ensures peak performance, better fuel efficiency and the least exhaust emissions. For optimum power and fuel efficiency, we install electronic fuel injection system in tandem with sophisticated computer controls and a high-pressure fuel delivery system. Our trained mechanics employ the updated diagnostic devices to detect issues in EFI system and resolve it. We can repair and service both manual and computerized EFI system.